Here is an interesting tale. Residents of Wood Street have had the benefits of the Plaza for a short while before the redevelopment of Marlowe Road destroyed it! 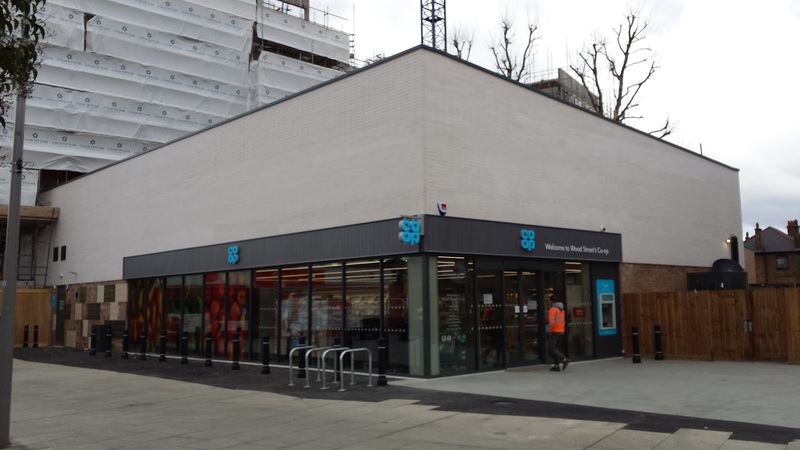 Recently the first building to be completed opened as the Coop. Little known to most people, hidden away in the Town Hall, there is a department which manages the street names in the Borough. A list is kept of names that are suitable for new streets - these can not duplicate existing streets, must be acceptable to the Royal Mail's national postcode system and mean something to residents. Locally people were happy with the Plaza as a name but it was never officially an address. When planning for the redevelopment of the Marlowe Road was underway it was clear some new street names would be required. Out of the blue the new address for the Coop became 7-8 Troubridge Square. So where did that come from! Well there is a very good answer below from the Council. The naming of Troubridge Square was undertaken in April 2016 in line with long standing practices whereby the developer and SNN Officer propose relevant names. Their suitability is ultimately agreed by the SNN officer to ensure the name is unique within the surrounding area as not to cause confusion for emergency services, delivery services and other relevant service providers. The assessment also endeavours to ensure that the address has some historical relevance to the borough. Troubridge met these criteria. This name has previously been used for a street in the Borough, “Troubridge Avenue“ in Walthamstow, as documented from the Walthamstow Historical Society website. This street was demolished and the name previously lost. The name comes from the Ship HMS TROUBRIDGE a WW2 Destroyer and was “Walthamstow’s Ship” having been funded by residents in an early incarnation of Crowd Funding, whereby a community was asked to raise funds to buy a ship in the 1942 “WARSHIP WEEK”. The scheme was successful and Walthamstow adopted HMS Troubridge. With regards to the name “wood street plaza” to my knowledge this had never formed part of any official address including that of the Co Op which was 164-166 Wood Street. My understanding is that the name wood street plaza was coined as part of the 2013 regeneration works when the granite blocks were installed. It would not have been possible to recognise this officially on the grounds of duplication with Wood Street which may have caused confusion. If you need any further information please do not hesitate to get in touch.